We booked our stay at Casa San Roque through Airbnb, but you can also find the hotel on-line at http://casasanroquevalladolid.com/web/. Casa San Roque is in a perfect location in the heart of Valladolid. It is less than 2 blocks from the center of town where the park is located. It is about 2 blocks from Cenote Zacil, a well-known restaurant/ cenote in town. It is also a short walk to all the major attractions including the convent. Valladolid is known for its Colonial architecture, history, shopping, restaurants and close proximity to Maya ruins and cenotes. I recommend you spend at least two nights in Valladolid. 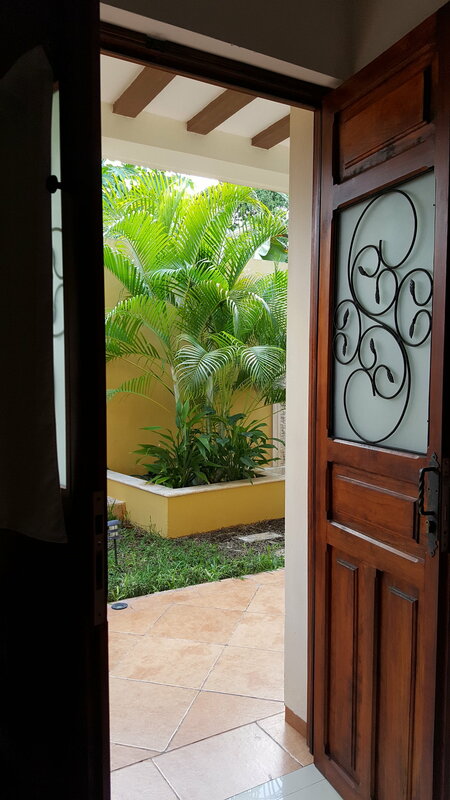 Casa San Roque is a family owned Bed and Breakfast that was once the owner, Manuel’s grandmother’s home. It is a very comfortable place located next door is the Museo San Roque on Calle 41. The front of the B&B has a simple entrance and street parking. The lobby area is lovely and you immediately feel like you are walking into someone’s home. Situated behind the entrance is the small kitchen, and upstairs we assume the family lives in the original dwelling. There is a walkway to the left that takes you to the rooms in the back. This quaint place still has much of the original Colonial wall in place. Between the main building and the new is a lovely garden seating area where they serve breakfast starting at 7 AM. 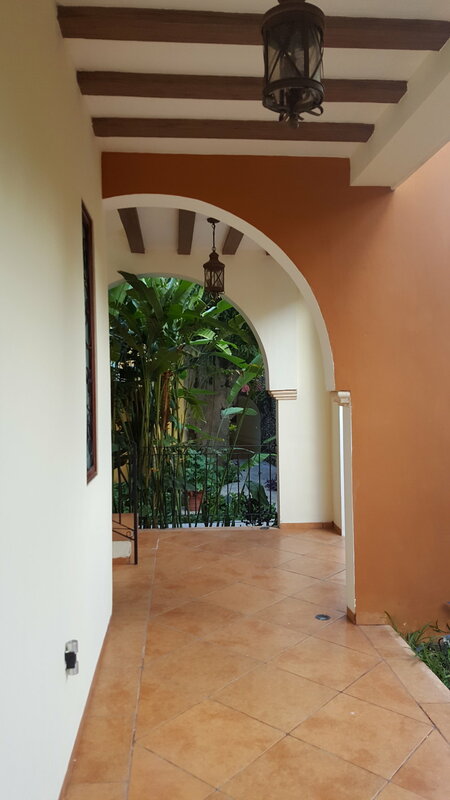 The architecture is a mix of old and new with a city meets hacienda feel. The rooms are good size and have large, comfortable furniture with a Spanish motif. The wooden double doors are gorgeous and the path along the stone wall is manicured and enhanced with a lovely fountain. The rooms are very clean and the staff is extremely helpful, attentive and pleasant. The two story building houses the bedrooms and behind them is a lovely pool. This may have been one of my favorite pools, it has a small fountain, is large and square with ample seating. We found it very refreshing after long walks in the city and days at the ruins. Casa San Roque is centrally located near some of the best restaurants in Valladolid, which makes it perfect for evenings, and you will want to enjoy their breakfast each morning. The night before they took our orders for breakfast. The first morning we enjoyed scrambled eggs with onion and Chaya. Chaya is a traditional staple in the Yucatan and is similar to spinach in taste andtexture. Breakfast each day came with juice, coffee, toast and fruit plate. The second morning we enjoyed eggs prepared with longaniza. a local sausage similar to chorizo but a little drier - a must have when you are visiting this area. Casa San Roque rooms come with free wifi, a safe and small refrigerator. We thoroughly enjoyed our stay here and would highly recommend it to anyone passing through Valladolid. If you go please tell Manual we said hello!